Last month I asked you guys for your feedback on gaming mice and keyboards because I was a little bit over my current wireless, battery/charge devices. I've had the same mouse (Logitech MX1000 Laser) since around the time WoW came out. I was ready for a change. After going through my usual process of studying the options, weighing out the pros/cons of each mouse, I ultimately made a decision that has made me very happy. 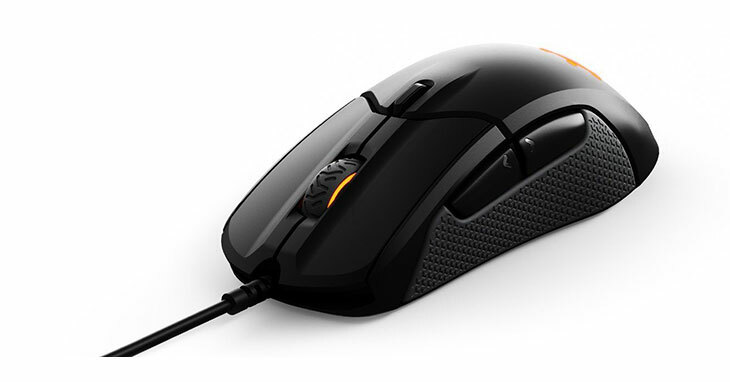 The Steelseries Rival 310 is a right-hand ergonomic mouse silicone grips on each side. There are two buttons for your thumb to interact with, a scroll wheel, and a button to change the DPI. I like my mice simple and comfortable. My hands are large which makes a palm or claw grip feel best for me, and the Rival 310 allows for both types of grips (even a fingertip grip too because of the silicone grips on the sides). The mouse is light but feels sturdy. Some mice I've used in the past by Logitech and Razer felt a little cheap. The 310 has a rough matte finish, but does have more of a plastic feel to it than my MX100 which was a little more hard and metallic feeling (despite being plastic, I know). How much of these are marketing speak and how much actually matter I'll leave up to you. The technical specs are not why I bought the mouse, other than no hardware acceleration and optical instead of laser. The Sensei 310 has the same tech specs with just a different form factor. The Sensei is basically the Rival without the right-hand design. 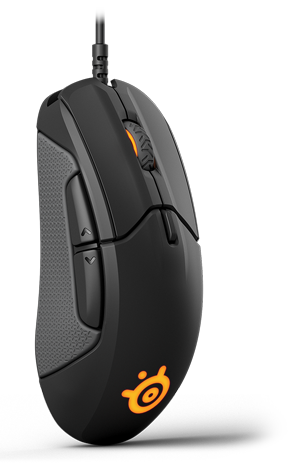 The Rival 310 comes with an 'engine' which is basically just software to change keybinds, create macros, set sensitivity and CPI, and program colors. All of the settings are saved directly to the mouse itself, so I'm pretty sure it can be plugged in anywhere and remember its settings. I am extremely pleased with the Steelseries Rival 310. I haven't found a mouse to beat my Logitech Mx1000 in over 10 years -- until now. If you're looking for a solid mouse with great customization and control, I definitely recommend the Rival or Sensei 310. Extremely accurate sensor that feels more accurate than mice I've used previous. Solid build materials that feel light, but not cheap. The rough matte is comfortable and looks great, and the Silicone side grips are awesome. 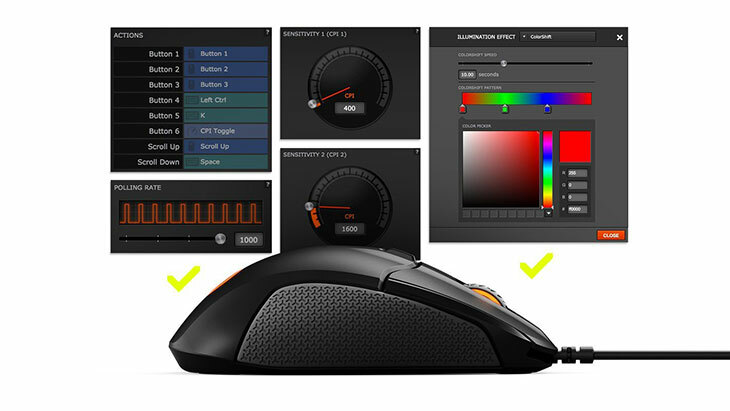 The customization via the Steelseries engine allows you to customize sensitivity as well as create macros or keybinds for the buttons. Mouse wheel is a little noisy. My wife even made a comment asking, "What's the sound?" It muted mechanical sound as it clicks past each point. Glad you found a mouse you like. I had an older version of the Rival that I enjoyed for a time but there were issues with the thumb rubber basically dissolving (Steelseries acknowledged and later corrected the issue) and issues with the software. It wasn’t the first time I’d had issues with mouse software and I decided I didn’t want or need software for my mice anymore. My new favorite is the Zowie EC1A which is very similar in shape to the old Microsoft Intellimouse. I love the shape and there’s no software for it. Just plug and play. Sensitivity settings can be adjusted with hardware switches. I really enjoyed my old Rival for a time. For as much as we use a mouse to interact with everything I think finding a good mouse is really important and often undervalued. Enjoy!